GRANITE . MARBLE . QUARTZITE . SLATE . Natural stone countertops are popular in kitchens for a reason. Granite countertops are often cited as the most durable material available and is known for resisting cracks and chips. Marble countertops the other hand, are very pretty, but delicate. All granite, marble, quartzite, slate, onyx - you name it, stone choices are a purely natural stone that come directly from stone quarries, and then are cut into thin slabs, polished/honed/brushed/leathered, and fabricated into countertops. The one advantage that natural stone has over an engineered stone is that every slab is slightly different in mineral pattern and color, meaning that your countertop will be entirely unique. What’s very beneficial most of the slabs come in all shapes and sizes. Sometimes more than 70 inches wide. For comparison, quartz slabs are seldom larger than 65 inches wide. Wide slabs are a huge benefit for kitchens with sprawling angles since they usually mean fewer seams, which a really great thing about that. 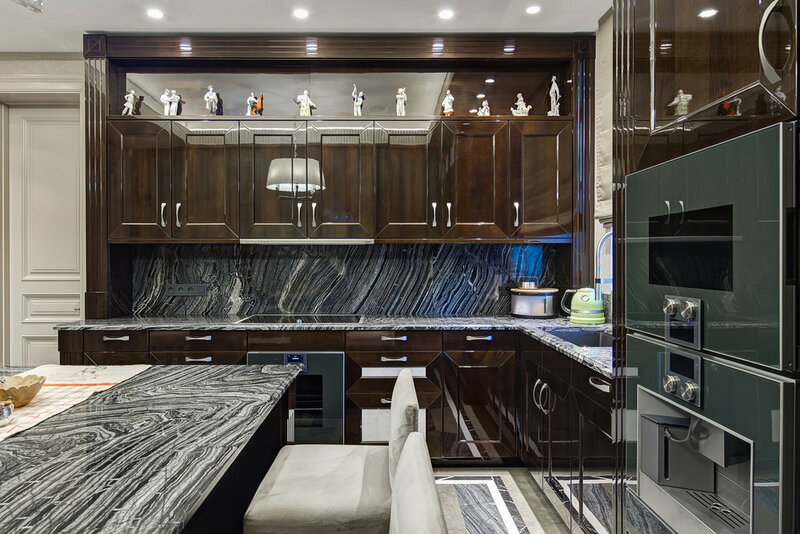 When you look at the natural stone, you see the striations and slight color changes that make the stone unique. The color and design are real. It’s a natural material with great variety, depending on which species you select and how it’s cut. It creates a really lovely natural pattern, which you don’t get with a lot of artificial materials. Often customers ask for white granite countertops, and yes, you will be able to find those, but you won’t find anything as white in nature as white marble for instance. With proper annual re-sealing, granite or quartzite countertops are quite resistant to stains. We are aware accidents happen–dishes fall out of cabinets, kids drop things on countertops, adults aren’t much better. Minor scratches or dings can be filled in with color-matching epoxy, and we can do it very professionally, but that does not mean you can abuse your beautiful natural workspace. Stone even though it’s “hard stone” need to cleaned/wiped dry after every meal preparation, or family gathering. Natural surfaces have a weakness, it’s the fact that it is susceptible to stains because of its composition. All natural stone because it’s a “natural” is porous, some more some less, and stains can be a real possibility unless you take 1-2 minutes out of your day to clean it, you will be just fine. Are you good about home maintenance projects including keeping up with regular granite countertops cleaning? Are you careful with juice or oil spills and similar events? If so, there is no good reason not to consider granite countertops. On the other hand, if you’ve got a busy lifestyle and would do better with a no-maintenance countertop, you’ve got plenty of good options there too. This is a personal choice only. Don’t let anyone else tell you which one looks better. There are some very beautiful brands that make great quality quartz like Caesarstone, Silestone or Cambria. Quartz countertops and granite countertops are also on equal footing when it comes to impact, neither is indestructible. The clean line most people prefer in countertops can be tricky to achieve with certain surfaces, especially when the material isn’t uniform. Each slab of granite, marble or quartzite is unique, it's not always easy to cut it just so and line up multiple slabs for a streamlined effect. Because quartz is manufactured, the pieces are uniform. Almost always you can count on where the seams will be. Also, quartz offers an abundance of color choices and potential for marble veining, and designs are better and better every year, which appeals to many people now-days. Some people love the look of granite more than quartz because it has a natural earthy aspect to it. Others prefer the sleek uniform look of quartz.